There is something really special about Senja. I loved my visit there because it allowed me to see a completely different side to Arctic Norway. As much fun as activities like husky and snowmobile safaris are, Senja has a number of unexpected ‘hidden gem’ activities such as their wonderful wildlife safari. While the main reason for travelling to Senja is usually the Northern Lights, I’m rarely surprised when our clients come back astonished at just how much more this part of the world has to offer. 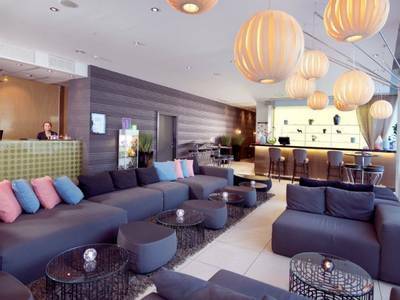 Senja showcases many of Norway’s highlights and this 3-night break is designed to encapsulate them all. You’ll look out for an array of marine life during a boat tour and at night, you’ll search for the Northern Lights from a hot tub, Aurora Lighthouse and a snowshoe walk. All this with a fantastic mountainous fjord backdrop. To know Senja is to love Senja (or at least that’s the case in our office!). 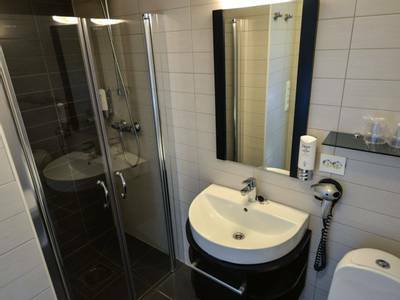 The small hotel of Hamn is set right on the harbour of a sheltered bay which eventually leads out to the vast Norwegian Sea. Regardless of when you visit, it is an idyllic and timeless setting with panoramic views of the harbour, which was used by fishermen for hundreds of years. 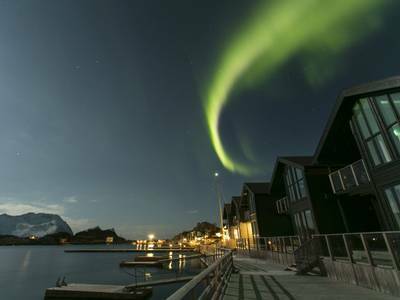 The location of the hotel, right on the water’s edge and away from almost all artificial light pollution, could not be better for viewing the Aurora Borealis. Sitting right in the heart of the Aurora Zone at a latitude of 69.41 degrees (anything north of 63/64 is normally considered in the zone), sometimes, you need do no more than just walk outside the hotel to see a display if the conditions are right. During your two daytime activities, your guided walk and wildlife boat safari, an abundance of incredible animals can be spotted. These include the likes of seals, soaring eagles and other birdlife. If you are travelling from January onwards, there is also the chance that you may spot a whale during your boat trip, but this very much depends on where the vital herring travel. Sightings are not as common as they once were, so please do not expect a whale watching tour. In contrast to the remote and peaceful setting of Hamn, the final day of your holiday sees you transported to the relative hustle and bustle of one of the world’s most northerly cities: Tromsø. You will arrive in style on the iconic coastal steamer Hurtigruten before exploring the city at your own pace for the remainder of your stay. 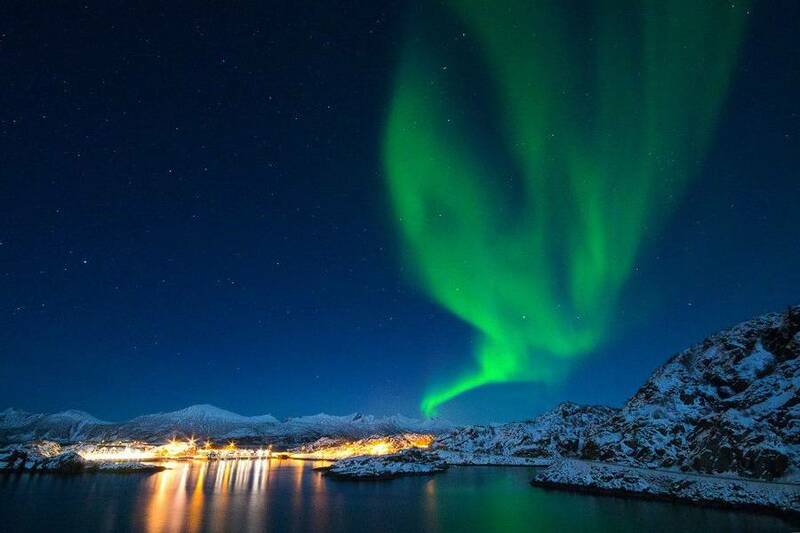 Tromsø needs no introduction to Aurora enthusiasts; it is regularly listed as one of the best places in the world as a base to see the Northern Lights. What we like about Tromsø is that there is so much to see and do during the day. A particular favourite is the cable car. In just four minutes you find yourself at an altitude of 421 metres with views to rival the very best in the world. Where else can you see the urban sweep of Tromsø - “The Paris of the North” – fjords, mountains and dozens and dozens of archipelago islands fading gradually into the ocean from just one vantage point? The word spectacular can very often be used unjustifiably but when it comes to describing the views from the Storsteinen Mountain it is barely adequate. Another favourite pastime is to visit Mack’s Ølbryggeri which is one of the world’s most northerly breweries (one opened in Ilulissat, Greenland in 2013 which was a mere 50 metres further north but pride of most northerly place goes to the brewery opened in Svalbard in 2015). We always recommend this place for a friendly welcome, fascinating history, the 67 different beers available and some delicious and reasonably priced food. The brewery runs daily tours at 15.30 for those wishing to enjoy the full beer appreciation experience. 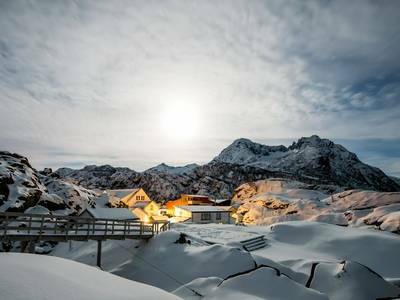 You will be met at Bardufoss Airport* and driven to your hotel on the north-west side of the island of Senja. It’s a journey of around 90 minutes and as you watch the islands and fjords glide by, it will become increasingly hard to believe that you were embroiled in the hubbub of a busy airport earlier in the day. After a warm welcome at the hotel, you will have some free time to check into your rooms and just gaze out the windows (you will see what we mean when you arrive!) before dinner is served in the hotel restaurant. Our friends at Hamn I Senja came up with the Northern Lights Lighthouse concept. Essentially, it is a traditional northern cabin known as a kota which sits on raised land behind the hotel. From this vantage point, you can enjoy 360° views across the fjords as well as the Arctic sky above. 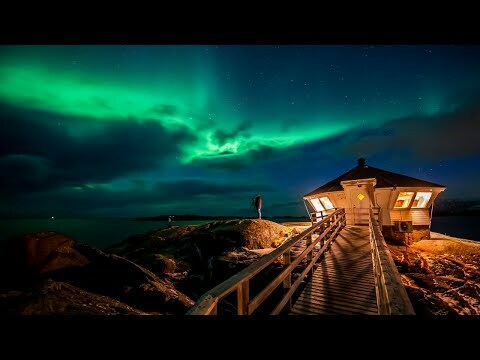 If the Northern Lights are visible then you will almost certainly be able to see them from the lighthouse. There is also hot berry juice to drink and reindeer skins to relax on. All in all, it’s a pretty civilised approach to Northern Lights viewing. A note on flights: flights are not included in the holiday price so that the best available fares and most appropriate schedules can be found at the time of booking. This route is served by both low cost and scheduled airlines and our Travel Experts will happily provide you with a quote and arrange flights on your behalf. * This holiday is designed to fly into Bardufoss and out of Tromsø. If you would prefer to arrive and depart from the same airport please get in touch and we will help arrange transfers to allow you to do this. After breakfast, you will meet your expert local guide and depart by car along the National Tourist Route on Northern Senja. This is one of only 18 such routes in Norway which have been granted the coveted ‘National Tourist Route’ status to reflect the exquisite nature of the surrounding area. On your journey from the airport yesterday you will have enjoyed a short taste of just why it has been recognised as one of Norway’s most outstanding and, indeed, astounding routes. You will visit the remote white sandy beach of Ersfjorden and make other stops at viewpoints and places of interest which may well have just passed you by without your guide’s local knowledge. You will be out exploring for approximately two hours before returning to your hotel for lunch. This afternoon you will have some free time to relax or take a short walk before your evening meal is served in the hotel restaurant. The hot tub boat is available to book any time up to 23.00 and can hold up to 15 people. It is great fun and also fully licensed so you can enjoy a glass of wine or beer whilst hopefully gazing at the Northern Lights. One of our members of staff, Amy, actually sat out in the hot tub while a blizzard raged around her. Protected by warm bubbling water and a woolly hat, there was no way she was going to abandon her glass of wine for a mere flurry of snow! Amy strongly recommends it as an unforgettable experience but she does add a note of warning. Getting out of the 38°C hot tub to take those six steps to the sauna took an awful lot of willpower! Later this evening we have included entry to the Northern Lights Lighthouse. If you were not lucky enough to enjoy an Auroral display last night then this could be your moment. If you did see the Aurora last night, it’s time to relax and enjoy the view because the Northern Lights are ever-changing and no two displays are the same. If you have an interest in photography is it possible to upgrade your activity this evening to a Northern Lights photography workshop. Suitable for complete beginners (or those with more experience) you will learn some of the really interesting skills and techniques which are required to successfully capture the Aurora. 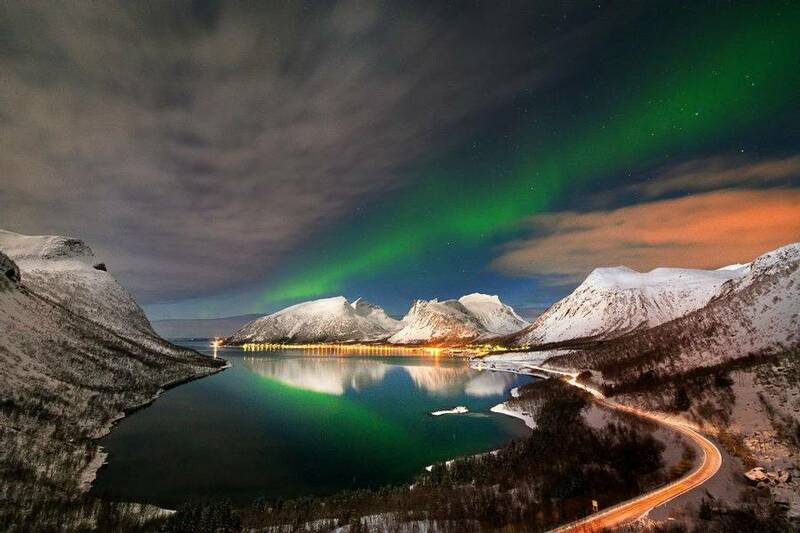 Superlatives just fail to describe the dramatic scenery of the Arctic Norwegian Coastline. Hamn I Senja is set right in the heart of one of our very favourite parts and today you will be able to discover a different perspective during your wildlife boat safari. Your guide will take you out to some of the completely unspoilt beaches and coves located a short cruise from the hotel where you are most likely to be able to enjoy some of the wonderful bird life and also seals who call this special part of the world home. You will be out on the water for approximately an hour and a half and hot drinks will be served during the trip. You will return to the hotel in time for lunch and your last afternoon is free to relax and just enjoy the striking land and seascapes. After dinner, you will try one of the oldest ways of travelling in Arctic Norway: snowshoeing. Walking with snowshoes on for the first time feels like strapping a couple of tennis rackets to your feet. It does take some time to get used to, but once you have found your feet (as it were) there are very few places you cannot go! The guide will provide a full safety briefing and the whole group will travel at a slow and leisurely pace. This activity is designed to allow you to try something new and have some fun along the way. The beauty of using snowshoes is that it does not take much time or effort to head away to a great Aurora vantage point. Then, it is just a case of waiting and hoping that the Northern Lights will appear and reward your efforts. 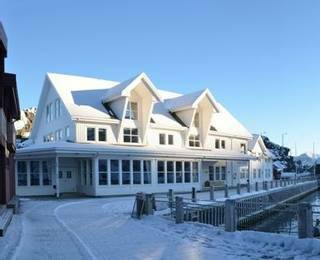 After breakfast, you will be transferred to the port of Finnsnes which is around an hour from the hotel. 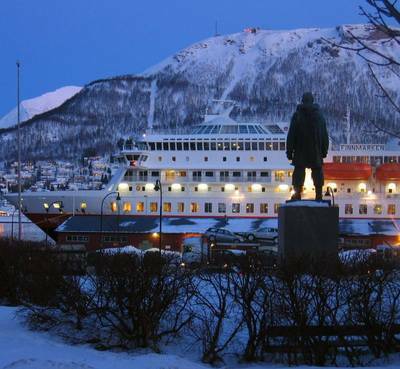 Once there you will board the iconic Hurtigruten Coastal Steamer. 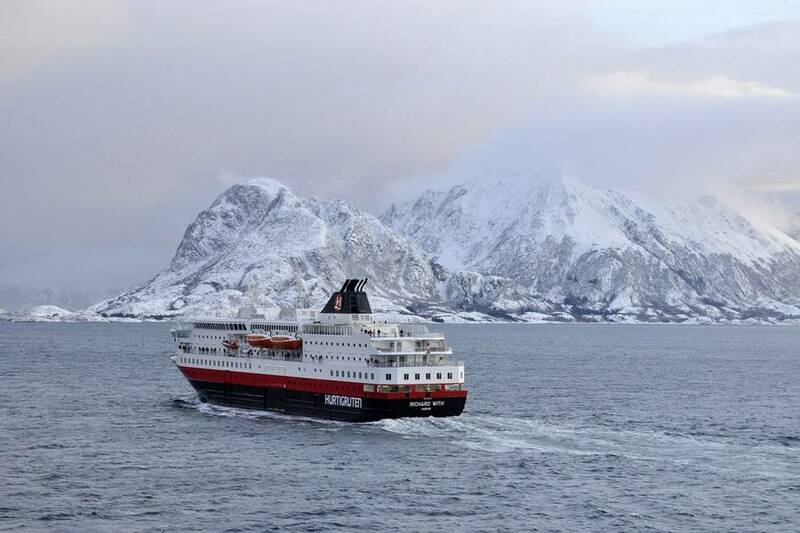 Hurtigruten began operating this service because, at that time, boat transport along the coast was infrequent and extremely slow. Many companies would not sail at night because there were only 28 lighthouses protecting almost 500 miles of coastline. This meant that boats could only operate during the day and it could take weeks to ferry people and goods along the coast. 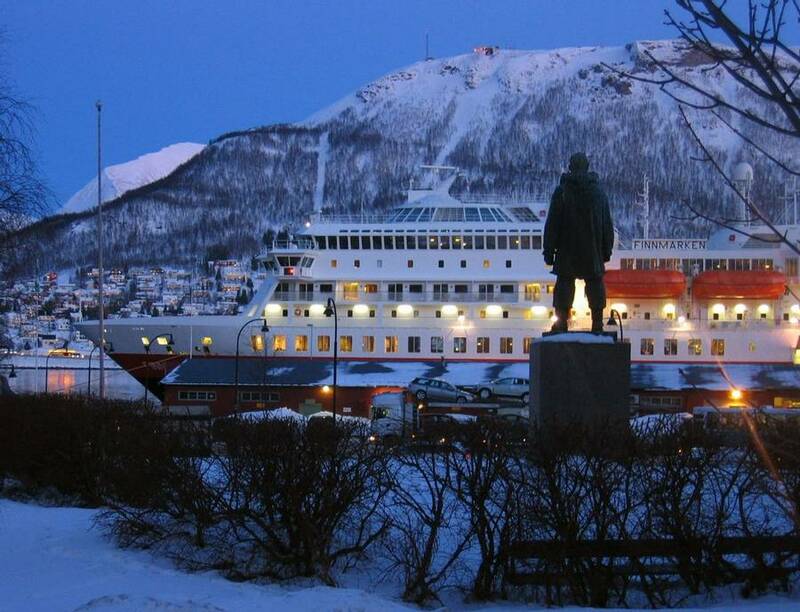 In 1893 the first Hurtigruten boat was brought into service and offered weekly departures along the coastal route. Nowadays, it is an integral part of the infrastructure of these small islands and their inhabitants. 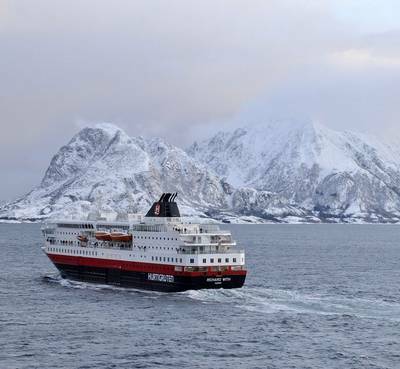 Hurtigruten’s fleet now boasts 13 vessels and there are daily departures along the stunning Norwegian coastline. 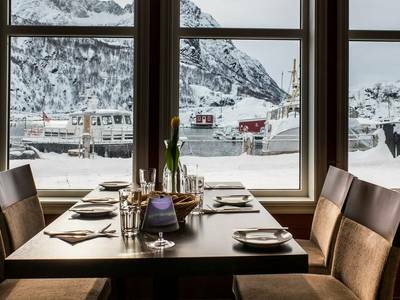 You will board the Hurtigruten vessel at around 11.30 and enjoy lunch on board. Our top tip here is to wrap up warm and find a spot outside, or, at the very least, next to a window. This is much more than just a transfer; it allows you a two-hour taster of this iconic route which has repeatedly been voted as the most dramatic cruise route in the world. 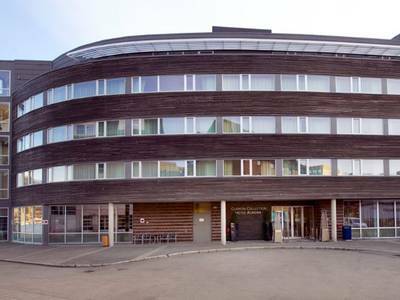 You will arrive at Tromsø at around 14.15 and take the short and very easy walk to the hotel (approx. 450 metres) to check into your accommodation. Please note a transfer is not included but we can arrange one in advance at a supplement. Just ask our Travel Experts for a quote. The afternoon has been left free for you to explore this charming town at your own pace. We have already mentioned a few of our favourite things to do in the overview for this holiday but another ‘must do’ are the Botanical Gardens. It’s a longish walk (approx. 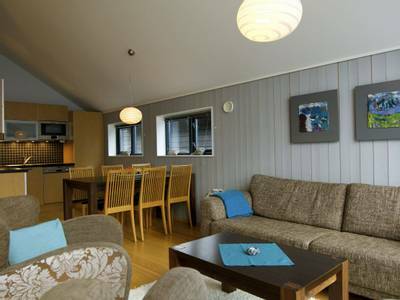 40-minutes) or the hotel can assist you in arranging a taxi (payable locally) to the most northerly botanical garden in the world. Whilst it is home to many thousands of plant species from all over the world the gardens’ speciality is plants from the Polar Regions or the high mountains. Entry is free (very rare in Norway!) and the gardens are all outdoors so please wrap up warm. 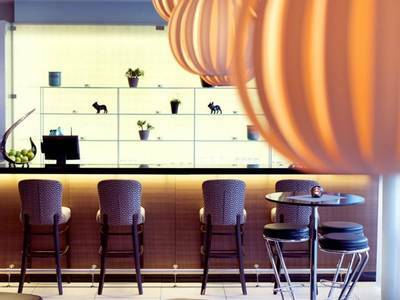 Back at the hotel, a light dinner buffet is included but you may wish to sample some of the local nightlife by visiting some of the bars or restaurants. Alternatively, we can book an additional Northern Lights activity if you want to really maximise your chances of seeing the Aurora. 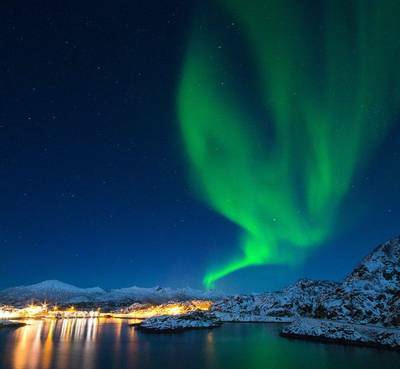 Please see the ‘Personalise’ section for your options but our two top tips here are the Northern Lights Hunt by Minibus or Northern Lights Dinner Cruise. Our Travel Experts will be delighted to discuss them with you in greater detail. Wow, what a holiday! Hopefully today you will be feeling fully revitalised by your time spent on Senja and in Tromsø but, sadly, it’s time to head to the airport for your flights home. Don’t worry though, we completely understand. Northern Norway is completely addictive! Just get in touch with us to discuss your next adventure. Perhaps you will visit a different region of Norway where you will discover new activities and a completely different landscape. Or, for a quite startling contrast, how about a summer trip to witness the same postcard views but this time as they are bathed in the glorious 24-hour daylight of the Midnight Sun. 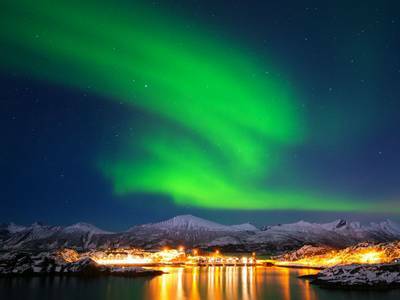 Departing from the harbour area of Tromsø, you will set out across the water via catamaran in search of the Northern Lights. The boat is charmingly comfortable with a viewing deck and a heated lounge for you to enjoy as you set off slowly across the water. 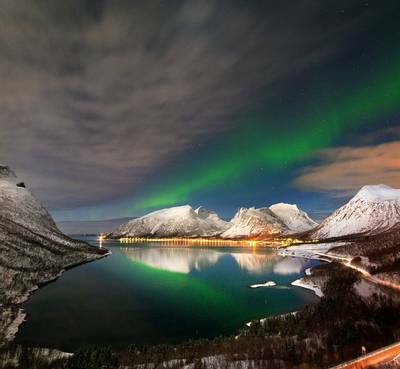 There is no artificial light pollution on the water and regardless of whether the Northern Lights do appear you will still be able to enjoy Tromsø from a wonderful new perspective and you will be able to see the illuminated Arctic Cathedral and Bridge. Dinner is a traditional Norwegian supper (usually fish based), served in the boat's indoor area whilst you wait for the Northern Lights to hopefully appear in the dark skies above you. Your host’s knowledge about the city and its surroundings, as well as their many years of experience of the Northern Lights, will make for a very memorable experience. Cold weather clothes are provided. 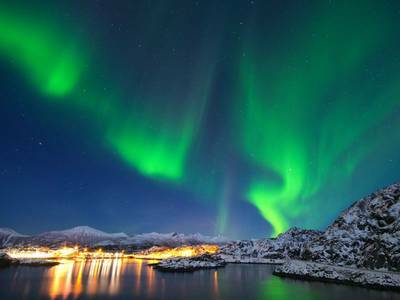 Head out by minibus in a thrilling search for the Northern Lights. 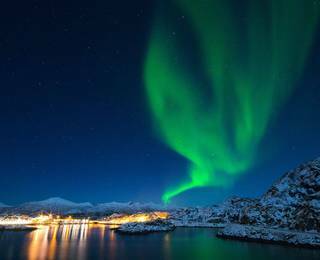 Your expert guide will lead the search using the latest weather and Aurora forecasts to maximise your chances of catching a display as you drive into the remote outskirts of Tromsø where the light pollution is minimal. Fingers crossed your hunt is rewarded with a dazzling display. Going swimming in the Atlantic Ocean is not something that any sane person would normally have on their wish list during a holiday. 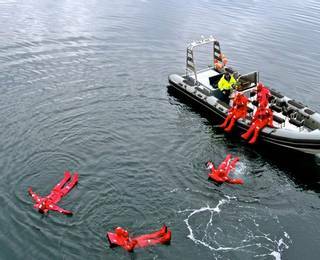 At Hamn they have invested in some state of the art survival suits which will keep you afloat and surprisingly warm and dry in this unique activity! Some people wish to just lie back and float around whilst gazing at the stunning scenery around them whilst others may wish to splash about and enjoy some competitions and races – the harbour is big enough for everyone to enjoy this remarkable experience in their own way. A short boat ride from the hotel there is a small ocean inlet which creates a maelstrom (a whirlpool naturally created by a current in the sea or in a river) with a top speed of around 7 knots. Once you have reached the inlet you will enter the water (wearing an insulated survival suit which will also keep you afloat and normally almost completely dry!). 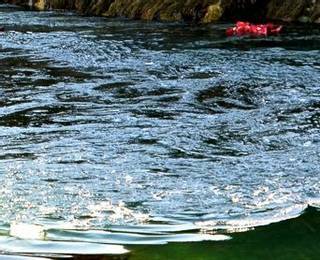 This activity is completely safe and suitable for all levels of fitness and swimming skill. You will be accompanied the whole time by qualified guides and a boat with a skipper who will follow your journey as you lie back, relax and just go with the flow (quite literally). There is something very freeing about completely letting go and enjoying the truly stunning scenery as you float along with the current. You just have to look at the pictures in the gallery for this holiday to see the backdrop to this magical activity. Please note: there is a minimum of 4 participants for this activity. If you would like to learn more about how to capture the majestic Aurora Borealis on film (which is not as easy as you may think) then this photo course may be an ideal add-on to your trip. A local expert will assist you in setting up your camera and offer some of the tips used by the experts to give you the best chance of coming back from your trip with some pictures to really wow your friends and family! There are few places we can think of as more relaxing and tranquil as Senja. If you are looking for somewhere just to get away from the world, recharge your batteries and unwind then this would be very high on our list. 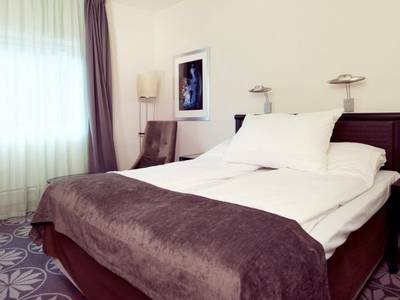 The fantastic food and extremely comfortable accommodation mean that you will want for nothing during your time here. There are also some additional activities which can be arranged if you would like to repeat an activity or try something new, be it fishing or body rafting Senja has plenty to keep everyone busy! 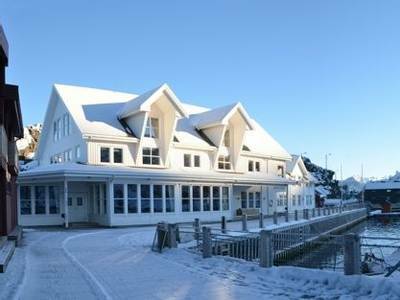 Flights to Bardufoss are not included in the holiday price so that the best available fares and most appropriate schedules can be found for you at the time of booking. This route is served by both low cost and scheduled airlines and our travel experts will happily provide you with a quote and arrange flights on your behalf. The food at Hamn I Senja was excellent, although it was a little strange to pick two out of three courses each evening. The trip dossier was very informative and the trip followed the plan well. Staff at both hotels were very good - enthusiastic and helpful. The evening snowshoe aurora hunt was fun, and seeing the scenery on the minibus tour & the boat was spectacular. We had a fabulous holiday. We did see a wonderful display of the Northern Lights at Senja. Despite horrendous weather, a break in the cloud around midnight for 45 minutes did the trick. Beautiful. Read more to finish it was excellent. We had a very nice stay in the hotel. We were lucky to be there during a solar storm and saw the aurora borealis each night we were there. The holiday was memorable, the location awesome and 3 nights out of 4 the Aurora was mind-blowing. Read more brilliant, and a lovely person to talk to whilst trekking for views of the lights! Activities were great fun, and very impressed with the level of care and equipment provided. The hike to see the lights was very basic. I do not mean this as a negative - something so simple was just brilliant. Sitting down after you've climbed, having a cup of tea and some chocolate whilst the guide described the area and the lights, was a truly unique experience. Especially with the lights across the sky. All staff at Hamn I Senja are so polite and accommodating, it really added to the overall experience. From initial enquiry to trip back to the airport in Oslo, this was one of the most enjoyable holidays I have had. Congratulations, you run a fantastic service.